In today’s world, more and more hybrid cars are coming on road as almost every country is struggling with increased emission levels. Despite of the ease in adoption, Hybrid cars are still not very cost effective. To counter this, an Indian tech. consulting company - KPIT Technologies Ltd. has come up with REVOLO - a plug-in parallel hybrid technology which could provide a solution in terms of cost effectiveness, adaptability and ease of use in developing world. Revolo is a plug-in parallel hybrid technology. It means it can work alongwith any IC engine. Revolo works in tandem with diesel or petrol engine. It is a "plug-in" system which you can retro-fit to any passenger vehicle. An electric motor of 7.5-10 kW power is placed in the engine bay and is attached to crankshaft with the help of a belt & pulley providing power directly to the drive-train. This specific functionality avoids costly replacement of drive train components and works flawlessly with an existing drive train. Battery pack comprises of valve regulated lead acid batteries which can produce 48 volts. You can charge it with a standard 240V power supply in the Indian households. 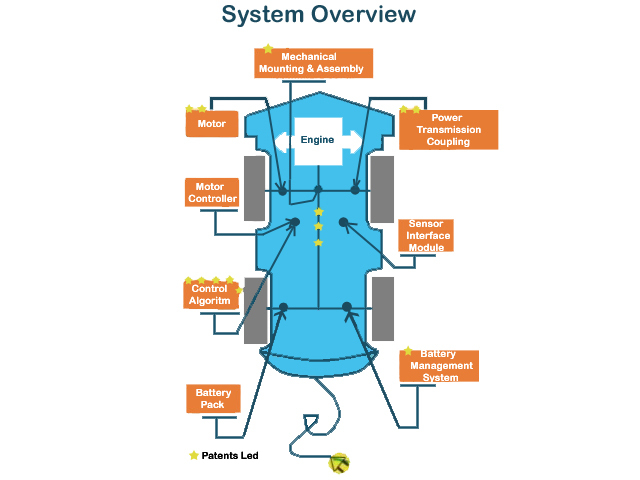 Revolo kit consists of an electric motor, motor regulator, battery pack, mechanical assembly & coupling, proprietary software & intelligent battery management system. The software plays an important role of identifying the time at which the IC engine wastes fuel or is stressed the most. Exactly at this time, it runs the electric motor which removes any excessive stress on the IC engine. All this process works simultaneously in synchronization with the engine thereby increasing its fuel efficiency and reduces emissions. Revolo works seamlessly with the engine and doesn't need any manual interventions. 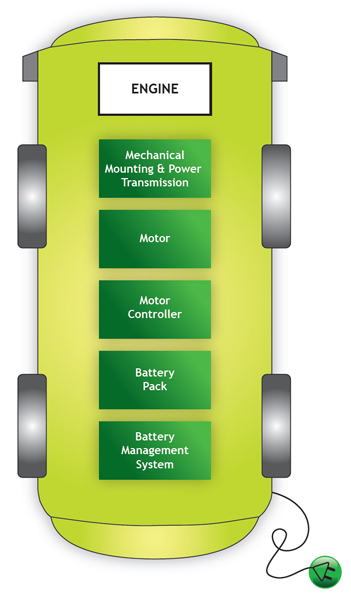 Being a plug-in hybrid, it can be fitted to almost any passenger vehicle regardless of the fuel it utilizes. Even if the battery drains out completely, the Revolo fitted car can still run on the normal IC engine. Revolo also implemented the regenerative braking technology. It keeps battery charging during the application of brakes of the car which is most convenient in the stop and go traffic situation. The smart algorithms of Revolo also identify the driving pattern of the vehicle. The system then adjusts accordingly to optimize the efficiency and provide long battery life. It is also comes with user-defined range, where the user can specify the desired range. The system works on it to provide optimum performance for that desired distance or range. The battery which is currently provided with the kit is maintenance free and reliable. The system is capable of working with various types of batteries such as lithium-ion batteries or lead-acid based batteries. In addition, it doesn’t interfere with vehicle's EMS (engine management system). Hence, it is adaptable to both types of vehicles having EMS or vehicles which don’t have EMS. The most important benefit of this brilliant product by KPIT is that you can fit it to conventional vehicles which ultimately helps in improving efficiency and reduce emissions. There is almost 30% reduction in Greenhouse Gas emission after the fitment of this system. Also, it demonstrated over 40% increase in overall fuel efficiency is during the ARAI tests. This solution will surely bring dramatic changes to the developing world by meeting their emission requirements in a cost-effective and trustworthy way. Also, Revolo will reduce the scrapping percentage of old vehicles!